After a day of rest, sleep, and unpacking, I’m happy to be home in San Francisco after spending the last week in Austin, Texas attending South By Southwest (aka SXSW). It was the most enjoyable week I’ve had in a long time both personally and professionally. So much fun that I didn’t stop to take many photos or blog much about it while it was going on. You can check out the few photos I did take over on Flickr. About a month ago I made the decision that I should be attending SXSW. It has been approximately 8 months since I quit my day job and started working for myself. Having the flexibility of being my own boss means I can make these last minute decisions, and I decided I should take advantage of that. Plus SXSW Interactive is directly related to my business of web properties and development. So I booked some cheap flights on Southwest, found one of the few hotel rooms left at La Quinta Inn, and prepared for the trip by scheduling what panels I would see on Sched. * Be social. Everyone at SXSW is a human being, they are not some rockstar. (If they act like it, see the below paragraph about douchebags) Be yourself and introduce yourself to everyone you get a chance to. For me personally I liked to introduce myself but not mention what I do for work or what company I work for. When people asked me what I did I would reply with something like “I own and run a couple of web properties, and enjoy doing fire art in the Bay Area”. I didn’t have any flashy new startup to brag about, and didn’t want to connect with people on a business level, but rather a personal level. I think a lot of “Social Media Experts” forget that underneath all the leverage, synergy, and monetization it’s all about connecting with people on a human level. Even if you’re an introvert like me, it’s very easy to met people and have valuable conversations because you will have similar interests with a large majority of people there. * The word of the year for SXSW 2009 is “douchebag”. 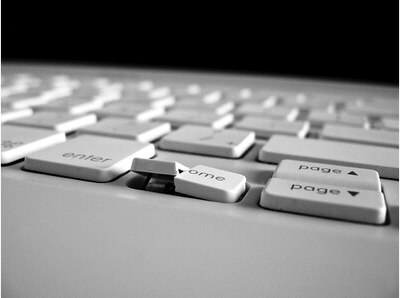 I’m a geek and I make my living off the web, I’ll be the first to admit it. I’ve been a geek my entire life, basically since I got my first computer at the age of 5. SXSWi is a heavily geek conference, however there are also the marketing, PR, and non-tech people floating around too. In addition to that there are people where this is their job, not their passion. It’s pretty easy to pick these people out, and relatively easy to avoid them. I’m actually working on a panel for next year in my head called “How Not to Be A Douchebag at SXSW”. Some initial hints: they refer to themselves as a Social Media Expert, they use the term new media, or they call themselves an entrepreneur. These aren’t instant classifications as I know some wonderful people like this, but they can be warning flags. Find the people you connect with, and then branch out from there. Chances are you’ll avoid the douchebags and have a great time. * There is value to the panels, talks, and conversations. I’m tempted to not get a badge, but I also feel like I got something out of the panels and talks. I attended a total of 13 panels. Some of these panels were not worth my time, where as others I found interesting and engaging. I paid for a Gold Badge, which was for both Interactive and Film. Unfortunately I only attended one film, the premiere of Objectified. It was a great film, but not worth the $200 upgrade to tack Film onto Interactive. If I were to do this again I would either stay longer and catch more films, or have to cut out panels or partying to catch more films. There were many films I’d like to see, but will have to wait until they come to San Francisco, the Internet, Netflix, etc. * Book a room at the Hilton, and book it early. I stayed at La Quinta Inn on Oltorf Rd, which was approximately 2.5 miles away from the Austin Convention Center. Every morning and every evening (aka 3am) I would have to catch a $10 cab ride. I did pay about half the rate of the Hilton (~$100 vs ~$200), but the taxi fares added up and having that commute every day was annoying. The Hilton is literally across the street, has much nicer rooms, and a much more social atmosphere. We spent a significant amount of time in the Hilton bar in the lobby too. If the Hilton is too full, there’s also the Courtyard Mariott and the Residence Inn Mariott just up the block, both perfectly acceptable hotels. They even have grocery delivery from Whole Foods! * Be prepared to wait in line. There are thousands of people at SXSW, so it’s only natural that there will be lines for just about everything. Usually the lines move pretty quick, but take the opportunities to have conversations with friends and strangers around you. More specific advice: Pick up your badge on Friday morning, early. The people that came in on Thursday will have either picked up their badge already or stayed out late partying. If you get to the convention center when it opens, the line should be nonexistent. I was 2nd in line to purchase my badge at about 10am. On the topic of lunches and dinners, try to eat at odd times. There were no panels between 12:30 and 2pm and the lunch lines grew large around 1pm. If there’s not a panel you want to see at 11:30, run and grab lunch at noon. You’ll be smiling as you walk past the long line of people waiting to eat. Oh, and sunday brunch at Taverna is not worth it. You’ll fight with locals for a table and may end up waiting 1.5hrs like we did. On the subject of parties, I have to contradict myself. There are a ton of parties at SXSW every evening, and many of the more popular ones will have long lines. Skip the long lines, and super crowded venues and find out where the real party is happening via Twitter, foursquare, friends, etc. Unless of course it’s the Laughing Squid party, then it’s totally worth the wait. That all said and done, let me put out my recommendation that yes, you should go to SXSW. It will be a week (or two if you stay for music) of a lot of fun. If you can get your boss to pay for it and you remember to attend a few panels, there’s even more incentive not to miss it. I bought my SXSW badge on-site at the Austin Convention Center. The process was painless, and except for the increased price for not getting it early, it was just as good. 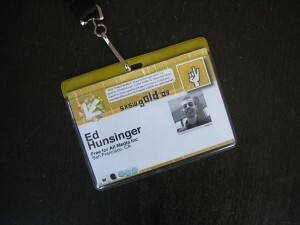 I bought a Gold badge so that I could attend both Interactive and Film events. My badge was printed on site, complete with a hologram and a black and white photo of myself. It’s tied to the purchaser and says so in big capital letters. When I compared it to my friends’ badges, it was missing one thing, an RFID. Between the four of us we had 1 platinum speaker badge, 1 normal platinum badge, 1 gold speaker badge, and my normal gold badge. Mine was the only one without an RFID. I’m still not sure as to the purpose of the RFID as I never once saw a reader. An article on a previous SXSW indicates badges for attendees would “use an RFID-enabled badge, also encrypted with a unique ID number”. They indicated that this would not be personally identifying information, but the fact that each badge was using a unique ID number means that each one is identifiable. This is just pure speculation, but it’s possible that SXSW could have been using the RFIDs with readers scattered throughout the convention center to track panel attendance. Again, I never saw an RFID reader and I was never scanned by anyone so I’m not sure of its purpose. In fact I hardly ever had to show my badge. One of the first talks we attended was Brian Bushwood’s “Social Engineering: Scam Your Way Into Anything or From Anybody”. He touched on many different social engineering tactics and sparked my idea of seeing how far I could get without showing my badge. The results? Surprisingly far. In the 5 days that I attended panels, I kept my Gold badge tucked away in my coat pocket or backpack. I was able to walk around the Convention Center freely, use the wireless internet access, buy food, hang out on couches, etc. without any hassle, or even a second look. 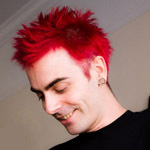 I was very recognizable and stood out with my bright red hair, so it wasn’t like I was fading into the sea of people. I often passed by 2-3 SXSW volunteers (sometimes only a foot away) who were standing guard at multiple entrances without any comments. When it came to attending talks and panels, it was just as easy. I made it to 12 different talks without showing my badge at all. I was finally asked to present it for my 13th and final talk on the last day of SXSWi, I think primarily because I was with a couple of friends who also weren’t wearing their badges at the time. * Wear a coat. The first few days were cold and rainy and I always had a coat on. Most people will assume your badge is under your coat. When the weather warmed up to 80 degrees, this wasn’t so much an option. * Bury your head in your iPhone/schedule/something, look like you’re deep in thought. Most people will want to be polite and won’t interrupt you and you can walk right past. * Stick with a large group of people, preferably in the middle of them. * Avoid eye contact. Don’t engage people that should be checking your badge. You want to get by and have them focus on the next person, literally forgetting about you in seconds. * Walk around like you belong there. Granted this was easy for me to do since I had paid for a badge, but anyone with some confidence could do the same. This is probably the most important thing and actually something Brian Bushwood echoed. So how many times did I have to show my badge during the week of SXSWi? Only 5 times: Picking up my shwag bag, free drinks/food at the Web Awards Pre-party, seeing the premiere of Objectified, my 13th and final panel, and the official closing party. Four out of those five instances I just flashed a badge that had stickers slipped in, covering up the holograms and most of my name and photo. All of the technical and physical anti-counterfeiting measures that SXSW implemented in their badges were basically rendered useless by the flaws in the social realm. As I said before, do not use this information for evil. 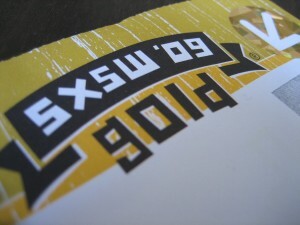 You should pay for a badge for SXSW, as it is an event that is definitely worth the price. If you do it early it’s quite affordable. I also imagine that this will be more difficult in the future as I informed SXSW employees of my experience in addition to making this post. UPDATE: My friend John Adams says that badge checking during the Music portion of SXSW has been much stricter than Interactive. Obligatory “I’m doing SXSW” post. Find me and say hi if you’re here too! It’s my first time and I’ve already learned something valuable: “Don’t get a hotel room far away” Looks like I’ll be racking up the taxi fares as well as the bar tabs this week! 2. Replace the platformHTMLBindings.xml file found in content/global with this one. 3. Zip or jar to recreate the archive (jar cvf toolkit.jar content/) and replace the original. 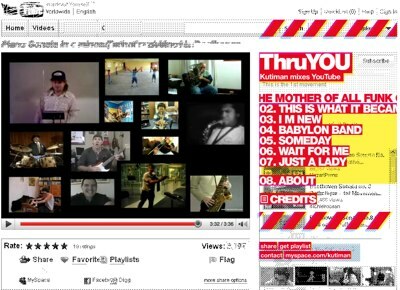 Thru-You is the new album by Israeli funk musician Kutiman. All of the album�s sounds were painstakingly culled from YouTube videos and masterfully mixed into 7 fantastic tracks. It�s like the �Entroducing�� of the internet! Hurry over to Thru-You.com to watch these amazing videos where you can also find the original links to all the sampled tracks by clicking the �credits� button.